The Farnam Sealtex Latex Bandage does not have a mesh or weave so does not become clogged with mud, and therefore absorbs no water. Ideal for wrapping legs where rubbing has occurred, or wherever use is required with no fasteners. 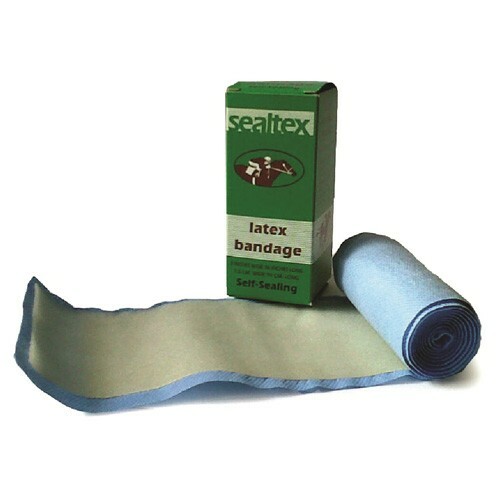 The Sealtex Latex Bandage is elastic but will not loosen and will only stick to itself, nothing else. It is also great for use around nosebands and other saddlery to protect your horse when extra care is needed. Gives a soft feel when used as a bit wrap which is perfect for use after dental work. There are currently no questions for Farnam Sealtex Latex Bandage - be the first to ask one!